Creative-R, the most fundamental force of the universe? What is more fundamental than all dimensions, yet is an integral part of all dimensions? What is at the foundation of all physical reality? What provides the deep mathematical structure behind all we know? What is present in every thought, emotion and action? What is at the origin of all organization? What leads our universe to be a participative universe? What leads our universe to be self-aware and conscious? What can be detected even in the far reaches of the universe? What creates the Universe Grand Design? What is the principle cause of all we know? What leads us to have body, brain, mind and soul? What leads our universe in the ultimate direction of love? 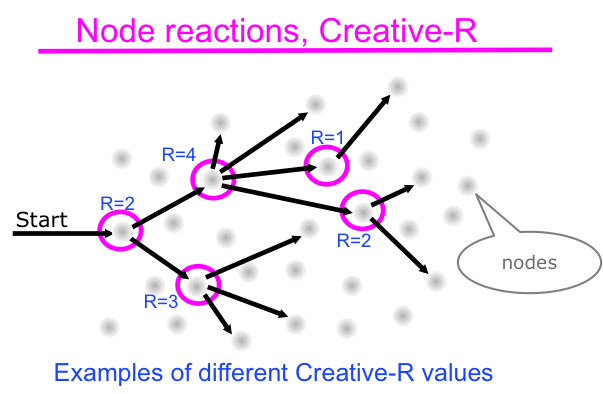 Creative-R is the dynamic reaction level when interactions meet. The diagram below illustrates it with examples for low levels of Creative-R (R=1,2,3,4). The Creative-R levels in nature are orders of magnitude higher than those in the diagram. That leads to an incredible transformation, largely overlooked in the sciences, education, medicine and elsewhere. You can watch this transformation in a 30 minutes show, PDF file (free download). Once you know, you will have gained insights from which to benefit a lifetime.